All of the scheduled Audrey Hepburn star vehicles have been shown before on TCM; but there are two premieres all the same: Laughter in Paradise (1951) and The Secret People (1952), two British productions in which Hepburn has small roles. (Actually, she has a mere bit part in Laughter in Paradise.) The former title is a comedy with a first-rate cast that includes Alastair Sim and Fay Compton; the latter is a thriller starring the capable Valentina Cortese and Serge Reggiani. 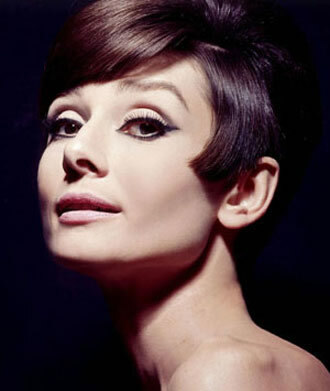 As for the major Hepburn vehicles, all of them are worth checking out because, well, Audrey Hepburn is in them. Now, in all honesty, I don't think Hepburn's performances always work, but when they do she can be as great an actress as the greatest of them. And when her performances aren't quite up to par, there's always that big smile, those big doe eyes, that long neck, those high cheekbones, and that music box of a voice. Hepburn is badly miscast in her then-husband Mel Ferrer's dismal Green Mansions (1959), but those who've never seen this tedious potboiler co-starring a pre-Psycho Anthony Perkins may find it unintentionally humorous. Hepburn is almost as poor in Billy Wilder's disappointing romantic comedy Love in the Afternoon (1957), whose subtlest performance comes courtesy of – gasp! – Maurice Chevalier. A tired-looking Gary Cooper is the leading man. Hepburn is perfectly okay (but not more than okay) in William Wyler's Roman Holiday, which earned her a Best Actress Oscar; an Oscar that should have gone to Deborah Kerr in From Here to Eternity, Leslie Caron in Lili, or Ava Gardner in Mogambo. Moving up the scale, I think Audrey Hepburn is just fine in John Huston's The Unforgiven, which some consider one of the director's worst films. I found it an enjoyable Western, boasting several good performances, including those of Lillian Gish and Audie Murphy. Burt Lancaster co-stars. Hepburn plays a half-Indian. Audrey Hepburn is also effective as Natasha Rostova in King Vidor's filmization of Tolstoy's never-ending novel War and Peace (1956). The problem with this mega-production is that even though it looks beautiful (cinematography by Jack Cardiff), for the most part the film sounds phony. (David Lean's Doctor Zhivago suffers from that same illness.) A pitiably miscast Henry Fonda as Pierre Bezukhov – a role written to order for Robert Morley – doesn't help matters any. But then again, not even the great Morley could've made believable Tolstoy's absurd ending for his most revered work. And finally, Audrey Hepburn is superb as the nun who begins to question her vows in Fred Zinnemann's sober religious drama The Nun's Story. Now, that was the year Hepburn should have won the Best Actress Oscar (which went to Simone Signoret for Room at the Top). 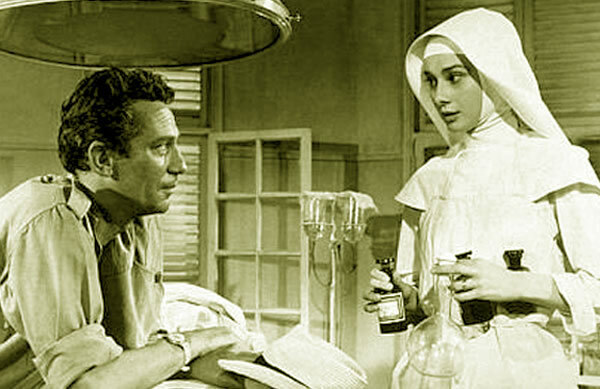 Peter Finch co-stars in The Nun's Story. A millionaire's will requires his heirs to perform outrageous stunts. Cast: Alastair Sim, Fay Compton, Hugh Griffith. Dir. : Mario Zampi. Black and white. 97 min. A refugee gets mixed up in a plot to assassinate the dictator who killed her father. Cast: Valentina Cortese, Serge Reggiani, Audrey Hepburn. Dir. : Thorold Dickson. Black and white. 95 min. A malicious student tries to destroy the teachers at a girls' school. 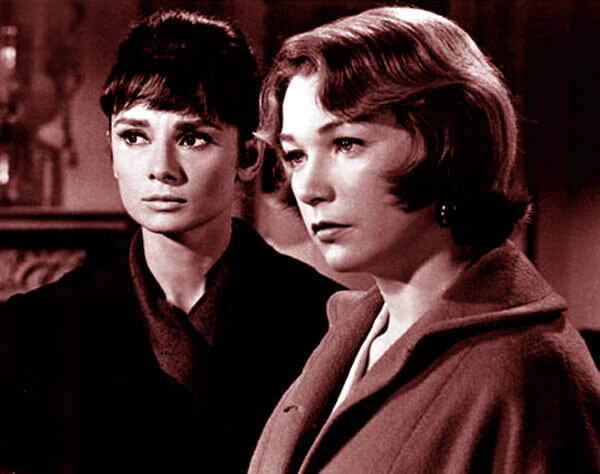 Cast: Audrey Hepburn, Shirley MacLaine, James Garner. Dir. : William Wyler. Black and white. 108 min. A headstrong girl fights the strictures of the Catholic church in Europe and the Belgian Congo. Cast: Audrey Hepburn, Peter Finch, Edith Evans. Dir. : Fred Zinnemann. Color. 152 min. Indians try to reclaim a rancher's adopted daughter. Cast: Burt Lancaster, Audrey Hepburn, Audie Murphy. Dir. : John Huston. Color. 121 min. A phonetics instructor bets that he can pass a street urchin off as a lady. Cast: Rex Harrison, Audrey Hepburn, Stanley Holloway. Dir. : George Cukor. Color. 172 min. An aging American tycoon overcomes his inhibitions to court a young Parisian. Cast: Gary Cooper, Audrey Hepburn, Maurice Chevalier. Dir. : Billy Wilder. Black and white. 130 min. A runaway princess in Rome finds love with a reporter who knows her true identity. Cast: Gregory Peck, Audrey Hepburn, Eddie Albert. Dir. : William Wyler. Black and white. 118 min. A young Russian girl fights to save her family during Napoleon's invasion of her homeland. Cast: Audrey Hepburn, Henry Fonda, Mel Ferrer. Dir. : King Vidor. Color. 208 min. A young adventurer falls in love with a mystical woman in the South American jungle. Cast: Audrey Hepburn, Anthony Perkins, Lee J. Cobb. Dir. : Mel Ferrer. Color. 104 min.